Think 5G welcome robots, 5G cloud computing terminals, 5G cloud games and 5G cloud virtual reality (VR) rowing machines, and hotel apps available on 5G smartphones. This is more or less what the hotel of the future may be able to offer if the vision of InterContinental Shenzhen, Shenzhen Telecom, and Huawei will come to life. The three organizations have joined forces to create the world's first 5G smart hotel. Under the plan, Shenzhen Telecom is deploying Huawei's 5G network equipment in the InterContinental Shenzhen for continuous indoor and outdoor 5G coverage, which will serve as a platform for the new class of immersive hotel services. InterContinental Shenzhen is the first Spanish-inspired luxury business hotel in China. It is also a leading partner for major local and global events. Deploying end-to-end 5G network with integrated terminals and cloud applications may indeed be the next logical step. 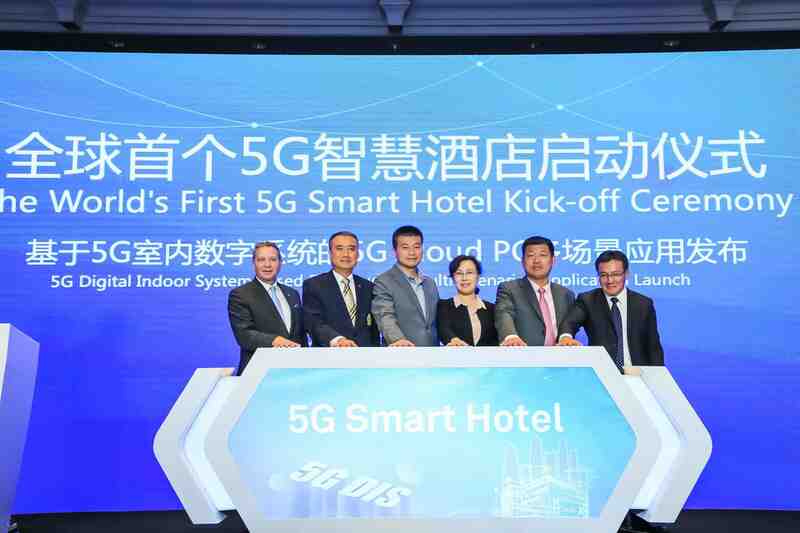 During the project’s kick-off ceremony, Shenzhen Telecom and Huawei jointly deployed a 5G Digital Indoor System on the hotel’s first floor and in the presidential suites, where cloud VR rowing machines, cloud games, and 4K movies were on offer. At the hotel lobby, guests were able to access the 5G network through customer-premises equipment (CPE) terminals or their smartphones to experience high-speed 5G downloads and uploads. Meanwhile, 5G intelligent robots provided services such as guest information, destination guidance, and goods delivery. “Guests expect new things and new experiences. The joint venture with Shenzhen Telecom and Huawei has brought more possibilities to the hotel,” said Golden Sun, General Manager of Shenzhen OCT Hotel Development Co. Ltd., in a news release. Sun disclosed that the 5G experience zone at InterContinental Shenzhen is the first step in the partners’ vision to build more 5G hotels in the future. “We hope that our experience can help the digital construction of the hotel industry and tourism," he said. Feng Wei, Deputy General Manager of China Telecom Shenzhen Branch, said the good number of VIP customers, high user experience standard, short delivery period and high construction environment requirements, all pose great challenges to network deployment and operation and maintenance. He said the 5G network experience zone with Gbps level download experience was deployed in two days. “In the future, we will provide complete 5G network coverage in the hotel, and build the benchmark for global 5G five-star hotels together with Intercontinental Shenzhen and Huawei,” he said. Dr. Peter Zhou, Chief Marketing Officer of Huawei Wireless Solution, said Huawei will continue to invest in 5G technology and create a trusted 5G ICT infrastructure to build 5G smart hotels with Shenzhen Telecom and InterContinental Shenzhen.